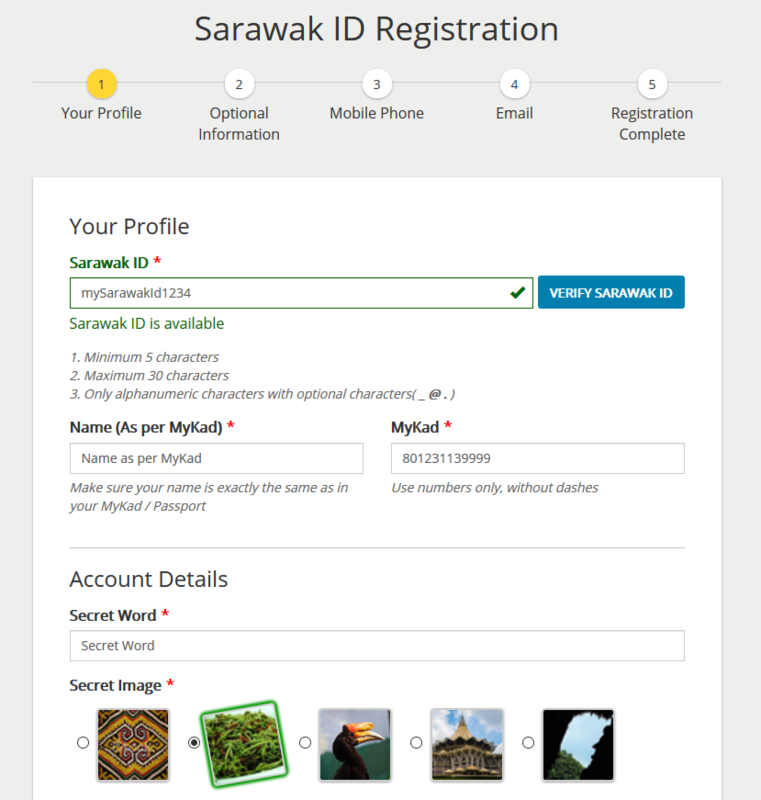 If you own a MyKad, choose MyKad. Otherwise, choose Passport (for Non-Malaysian). 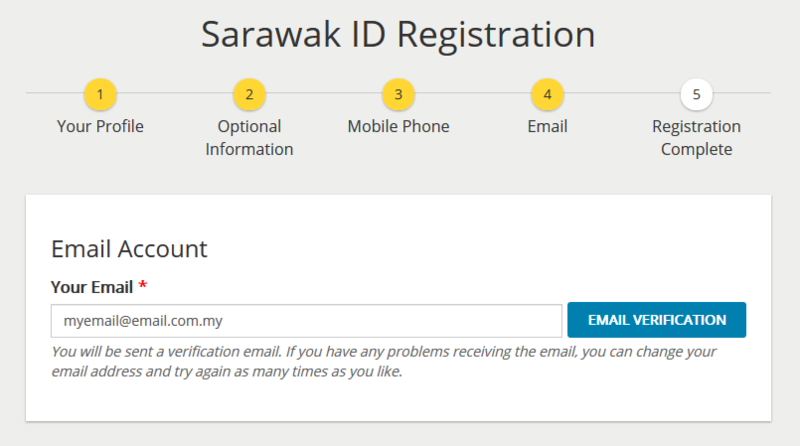 Pick your Sarawak ID and click "Verify Sarawak ID" to check whether it is available. 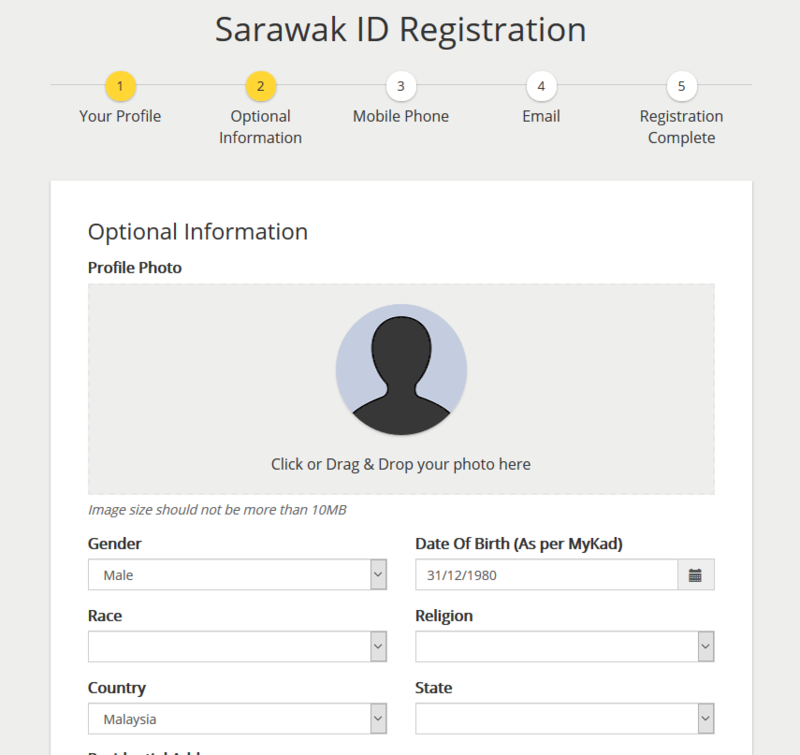 Then, fill in your name (as in your MyKad) and MyKad number. If you are using your Passport, fill in your passport information. All information on this page is compulsory. Click "Submit". 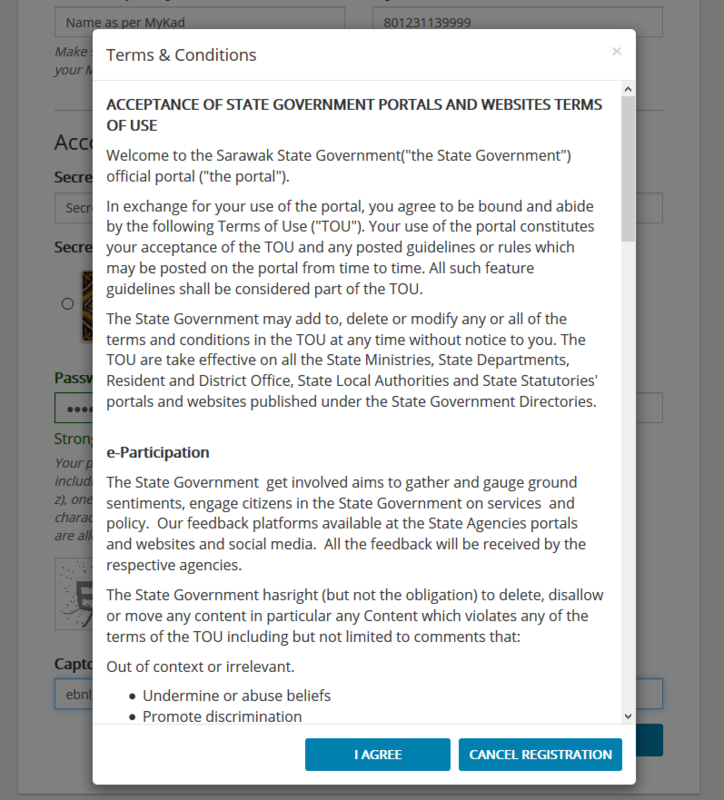 The "Terms and Condition" of use will appear, choose either "I Agree" or "Cancel Registration". You must choose "I Agree" to continue. The information on this page is not compulsory.Fill in the information on click "Next" to skip this step. You can always update these information in your personal profile later. Key in your mobile phone number. Verify your number by click 'Request OTP'. This will send a One Time Password (OTP) to your phone. If you do not receive the OTP, click "Resend OTP" to request the OTP again. Once you receive the OTP, key it in, and click Submit. If the OTP is correct, your mobile phone is will be verified. 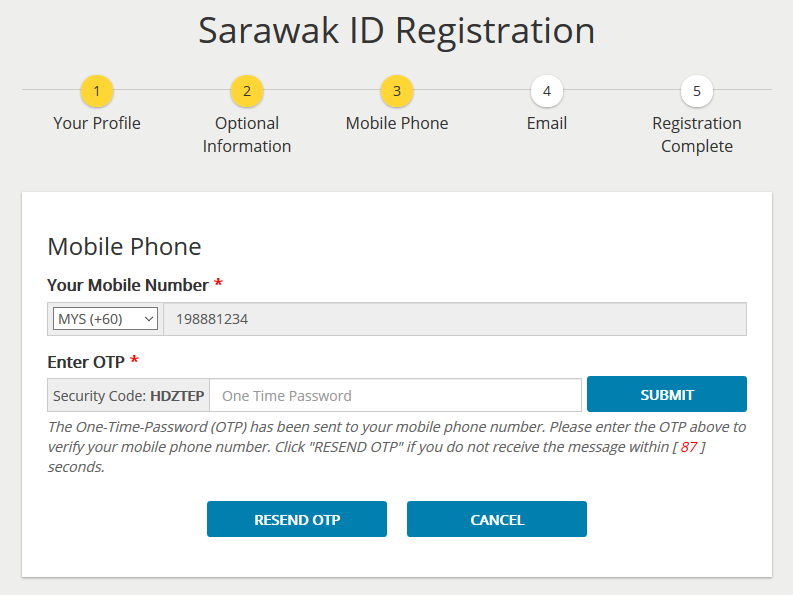 If you do not wish to verify your mobile phone number, or have problem receiving the OTP, you can click "Next", to skip the verification process. You can always verify your number later, in your personal profile page. Key in your email address and click "Email Verification". This is compulsory and cannot be skipped. An email will be sent to your email address. Please click on the activation link in the email. 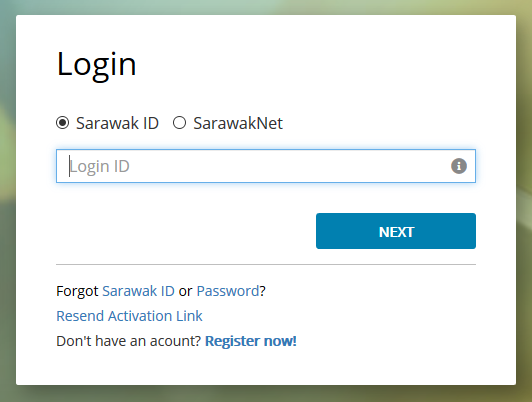 Congratulation, you have successfully register your Sarawak ID. 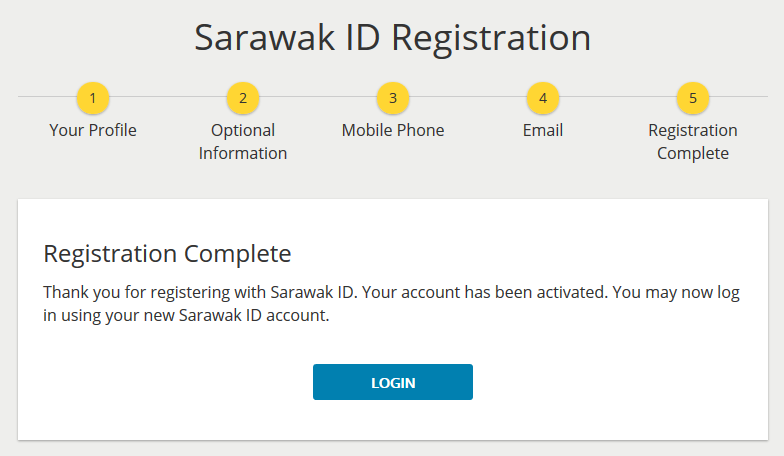 Congratulation, you have successfully register Sarawak ID.